Series Volume 5: Why Build an Effective Board For Your Company? So, what exactly do we mean by your Sphere of Influence? This refers to your Board's industry & vertical diversity and experience. You can think of your Sphere of Influence (people) as including chosen skillets in vertical orientations. I am personally a proponent of having Board representation from numerous industries at the table, not just those with direct experience in your company's vertical. Some of the best strategic plans for Boards I sit on have been created through the melding of concepts from multiple industries. Don't make the mistake of creating a team of mini-me's all with the same background and experience - you will be effectively creating a bubble of intelligence that is insulated from the rest of the world's best practices - a dangerous proposition in these times of fast change where quick adaptability is one of the keys to survival. An example of an actual Sphere of Influence (correlating to 1 and 2 above) that we utilize at Integral Board Group to service clients is seen above. 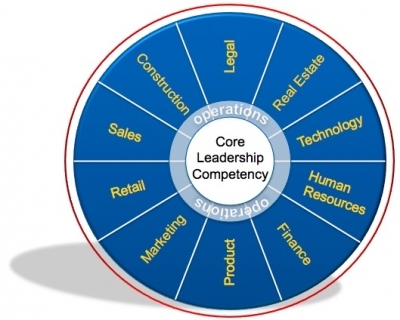 Note the importance of the center area calling for a core leadership competency as well as operations experience for each board member. It then fans out into specific skillset & expertise areas which are integrated across multiple industries & vertical experience. In our model, these 'coverage' areas are spread across 5 board members for a tight team. Your specific Sphere of Influence will vary depending on your business needs, but know that this model can be easily adapted to any company. Another important consideration (correlating to #3 mentioned above) is your stage of growth as well as your growth aspirations. Know your current business stage of growth and build your team accordingly. Consider if you need specific skillsets and experience for transitional times in your growth plan or a core team to stick through the entire lifecycle. Other options include supplementing your core board with Board Advisors to guide through each transitional period. These are not easy decisions, but know that you have options.